Data is at the heart of today’s financial industry. Financial companies depend not only on data accuracy, but also on high-speed transactions, data protection and privacy, data-driven insights and data personalization tools. This is why Redis Enterprise is the best tool in the industry; it can be employed in a variety of use cases, and is currently used by organizations ranging from major credit card companies to consumer and corporate lending firms. Redis is a high performance, in-memory database that offers high throughput and low latencies while being versatile and easy to use. Redis Enterprise takes Redis to the next level to meet the financial industry’s rigorous demands; it does this by enhancing Redis deployments with no-hassle scaling and clustering, high availability, data persistence, cross rack/zone/region in-memory replication, instant automatic failover and backups, and 24/7 expert support. Not only does Redis Enterprise ensure optimal performance — at times attaining speeds of 2 million operations per second — but also it enables Redis to run on Flash memory, making it possible for users to process and analyze extremely large datasets while decreasing potential costs by over 70 percent. With Redis Enterprise, financial companies can be sure that they are remaining compliant with regulations while simultaneously reducing the risks and costs typically associated with database deployments. Please download our ebook to learn more about how Redis Enterprise can be used for financial services. The financial industry should consider adopting Redis Enterprise for a variety of use cases. It can help facilitate high-speed transactions, such as processing Apple Pay payments with low latencies or driving global wire-transfer reconciliation for multinational banks. Redis Enterprise also allows businesses to personalize user experiences, which in turn drives growth among customers and prospects alike. Moreover, by implementing high-speed data crunching and fraud detection, Redis Enterprise can be deployed in numerous risk management scenarios. Not only that, but Redis data structures accelerate processing and allow for faster responses to analytical queries, making Redis Enterprise the perfect resource for business insights. 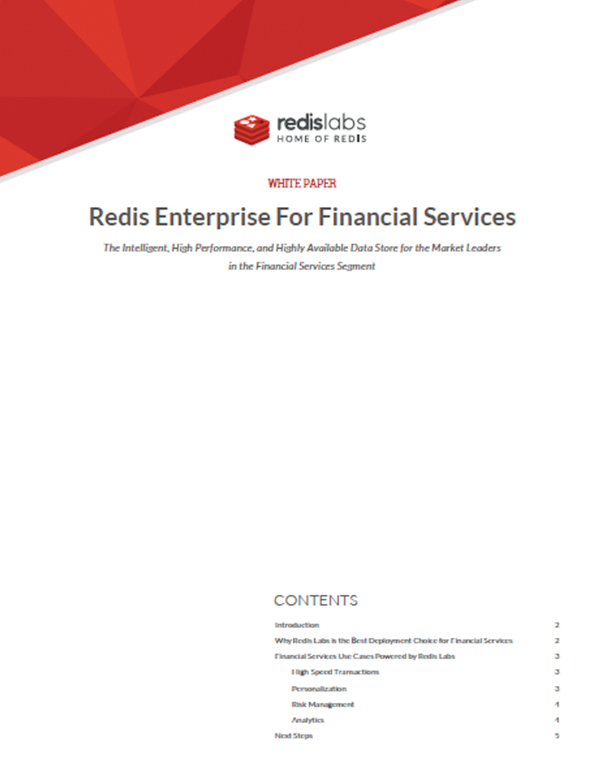 For more information on the financial service use cases that Redis Enterprise can address, please download our ebook.